Minister of External Affairs, Sushma Swaraj, tweeted on 27 September and informed everyone that six more Indians were identified after the Saudi authorities released photos of 1090 deceased pilgrims. This has taken the total number of Indians dead in Mecca stampede to 35. 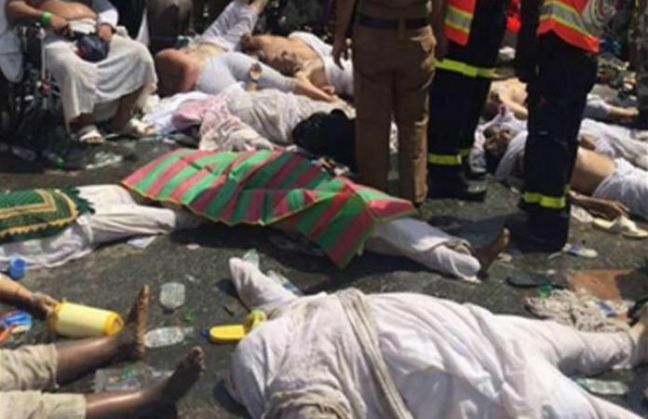 The authorities had earlier identified seven more Indians who lost their lives in the Mecca stampede incident that happened on 24 September. Hajj Consulate in Jeddah identified the deceased as Mansurul Haque (Jharkhand), Anvar Janha (UP), F A Muneer Veetil, Amina Beevi, Abdul Rahiman Asarithodi, P V Kunhimon and Moiuddin Abdul Kader (all from Kerala). Mina for symbolic stoning of the devil. This was the second major accident this year for pilgrims, after a construction crane collapsed on September 11 at Mecca's Grand Mosque, killing over 100 people, including 11 Indians.